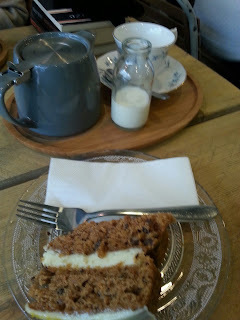 I have discovered a little gem of a teashop in, of all places, Huddersfield. While you might not expect it at first glance, Huddersfield is actually studded with lots of gorgeous little places to eat and drink, of a surprisingly high standard. One of these is the Northern Tea House. It has a very welcoming atmosphere, edgy décor that mixes industrial chic with a traditional background, and absolutely delicious cakes. It is bright, clean and cosy. I've only been once, and didn't have time for a full on afternoon or cream tea, but I did indulge in a sumptuous, moist slice of carrot cake. 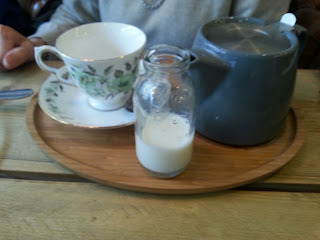 I like the crockery - vintage feeling glass plates and pretty bone china cups. I am not so keen on the industrial-looking teapots - I would prefer bone china ones - but I have to admit that they work with the fusion of industrial, New York loft/traditional Cath Kidston chintz style. And I love the little mini milk bottles! My visit was short and sweet, but I am already hooked, and will definitely be back very soon. Of course, I'll have to try a cream tea and review it, won't I?